After almost a year in the making, a magical egg hatched at Nowra Showground recently. The Paint Shoalhaven REaD, Black and Yellow Committee welcomed hundreds of children from preschools across the Shoalhaven to witness the big moment. The egg started out in March roughly the size of a soccer ball and visited many pre-schools across the region. It was painted and decorated by local Shoalhaven elders. The magical egg was carried away to the special birthing place. Agy the red-tailed black cockatoo emerges from the egg. As children read, sang and danced to the egg throughout the year, it continued to grow in size. On Monday, October 23, Agy the red-tailed black cockatoo was revealed. According to national organisation, Paint the Town REaD, more than 20 per cent of Australian children arrive at school without the skills necessary to make the most of their early education. Research shows that no matter how good their subsequent teaching, these children can fall further and further behind. They may struggle with literacy, employment, health and happiness for the rest of their life. Paint the Town REaD works to overcome this by motivating communities across Australia to read, talk, sing and rhyme with their children so they’re ready to learn to read and write at school. The organisation partnered with Cullunghutti Aboriginal Child and Family Centre to bring the magic to life. Christine from Sanctuary Point Connect said reading and literacy was at the heart of the project. “It’s all about encouraging children to read from birth and we’re going to read to the egg one last time today,” she said. Christine said Agy will continue her work around the Shoalhaven for many years to come. 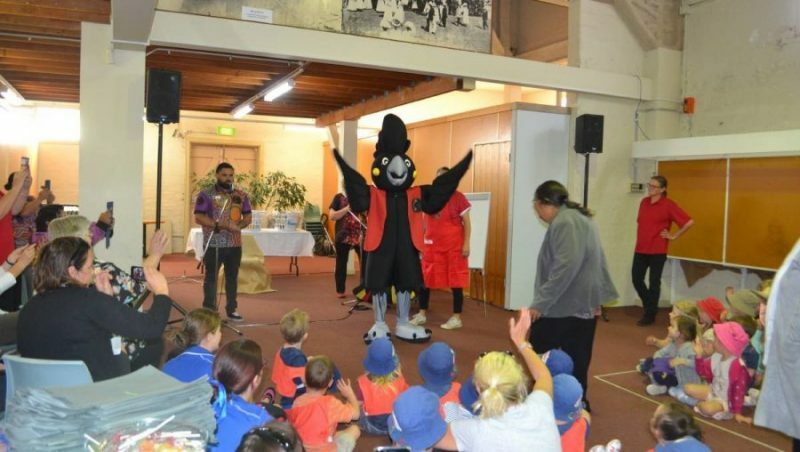 “The red-tailed black cockatoo is significant to the Shoalhaven Indigenous community and Agy will go to community events across the region, promoting reading and singing,” she said.